Oct 25, 2016- Nepal has been named on top ‘Best Value Destination’ and 5th on the top 10 countries in the world to visit in 2017, according to Lonely Planet’s annual Best in Travel list released on Tuesday. Nepal is the only destination in South Asia that has been featured in Lonely Planet’s Top Ten Destinations Guidebook. Among the top ten countries, Canada is number one followed by Colombia, Finland, Dominica, Bermuda, Mongolia Oman, Myanmar and Ethiopia. “It is a great honour for Nepal to get a place in such a prestigious guidebook. I do believe that it will give positive message to the international travel community and inspire them to visit Nepal in 2017,” said Joshi. Over the past four decades, Lonely Planet has cultivated a dedicated traveller community. More than 130 million Lonely Planet books—to almost every destination on the planet—have now been printed in 14 different languages. On 25th April, Nepalese had to to go through drastic unforeseen natural calamities earthquake of magnitude 7.6, due to where millions of people have lost their homes and thousand of people have lost their lives. It has been very sad moment for the country and its people which made them panic. 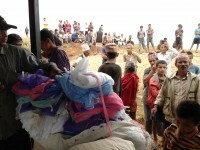 As millions of people have lost their homes, we have been involve on different relief items distribution to the quake victims in different wards of Dhading, Gorkha, Nuwakot. 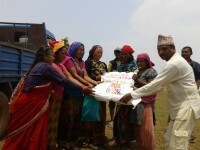 We had distributed tarpaulin, mosquito nets and foods items to the quake victims in which we received support from many friends through Alpine Explore Nepal and Arkoreiser AS team and friends in Norway, Slovenia, Denmark, Netherland other friends from different countries. We are happy that our support have been great help to the quake victims in different region so we thank you very much for all our respected friends who have been active and have contributed to the quake victims through us. All our guests are very keen on harvesting coffee cherries. Its lucky to be there during harvesting season as we can see ripe coffee cherries around the coffee farm which makes one feel awesome being at this moment. Its our second coffee harvest and we have harvested about 2000 kgs of coffee cherries during March month. As we have coffee in larger quantity, we have started using coffee pulping machines and we are very excited to grow larger amount of coffee each year. Staying in a simple resort located in the middle of the coffee farm (surrounded by coffee plantation), having good panoramic views of the Mountains, where organic foods are served, one can feel like being at the real paradise. Whilst away from the center of city with its noise pollution and from the crowded people is just awesome.